War Savings Societies were organizations that were formed by citizens to raise money to support the war effort during the First World War. The Societies would have war bond drives and also sell savings stamps that could be redeemed for a bond once a sufficient number had been accumulated. Of course, the members of these societies also purchased bonds and stamps themselves. The Prudential, under the leadership of Forrest F. Dryden was an enthusiastic supporter of the W.S.S. 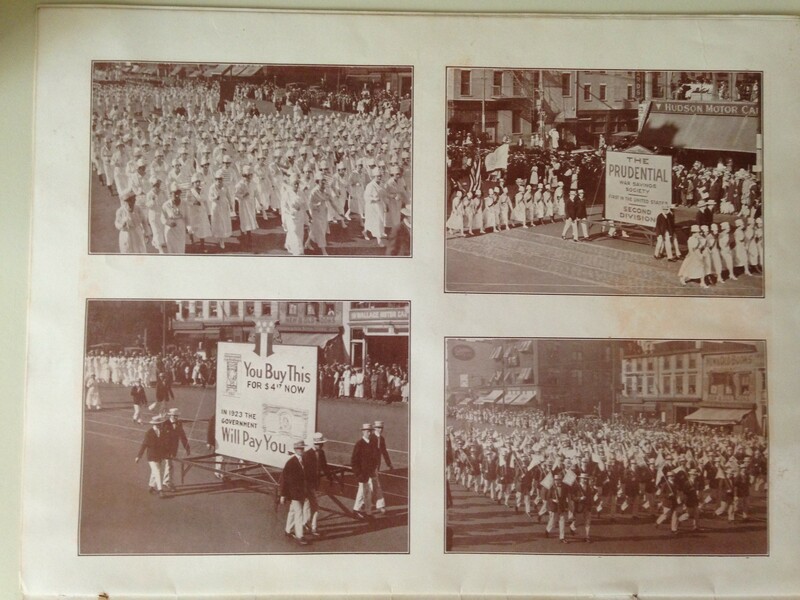 movement and provided the impetus for the parade held on the afternoon of, Saturday, June 15, 1918. The parade followed a two mile line of march down Broad Street past the Prudential Home Office and past the “Four Corners” and the central business district. There were various military bands, including the Naval Band from the Pelham Bay Training Station. The band had eighty five members, clad in blue jackets. Among their musical selections were “Over There” and the French national anthem “La Marseillaise”. Newark’s school children , numbering in the many hundreds made up the first division of the parade and sang and marched for the entire parade route. There was also a contingent of French soldiers, known as the “Blue Devils” many who had won the “Croix de Guerre” and “The Legion of Honor” two of France’s highest honors. The floats ,of which, Prudential provided four were quite attractive. The first bore a large Liberty Bell and fourteen “Prudential girls”, one representing the Goddess of Liberty and the others the original thirteen states. That float was flanked by an honor guard of twenty soldiers in Continental costume. The second float was “My Soldier- a Prayer for His Safe Return”. It represented a child’s bedroom, the back of the small bed was against a partition which had the picture of a soldier. A young mother is seated with a child kneeling beside her in the act of saying ” Now I lay me”… and a prayer for the safe return of his “Daddy”. 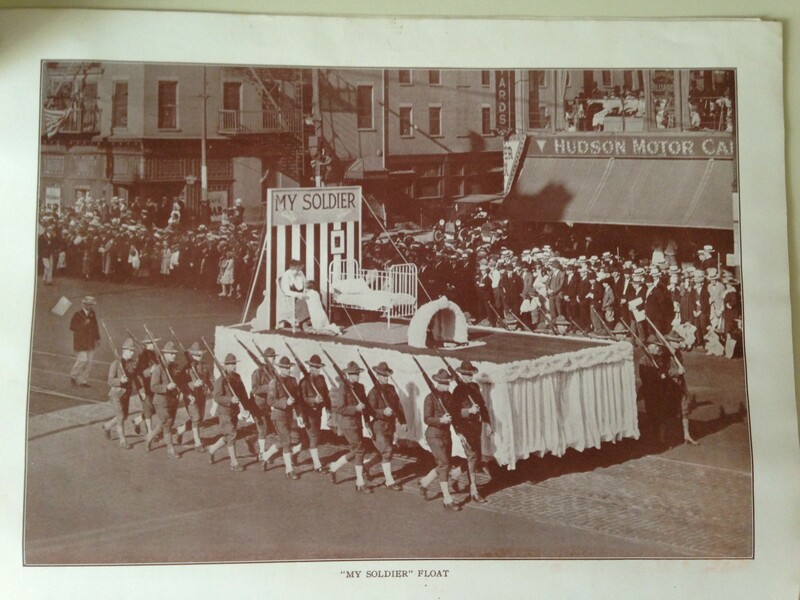 This float had an honor guard of twenty-four soldiers from Camp Dix. 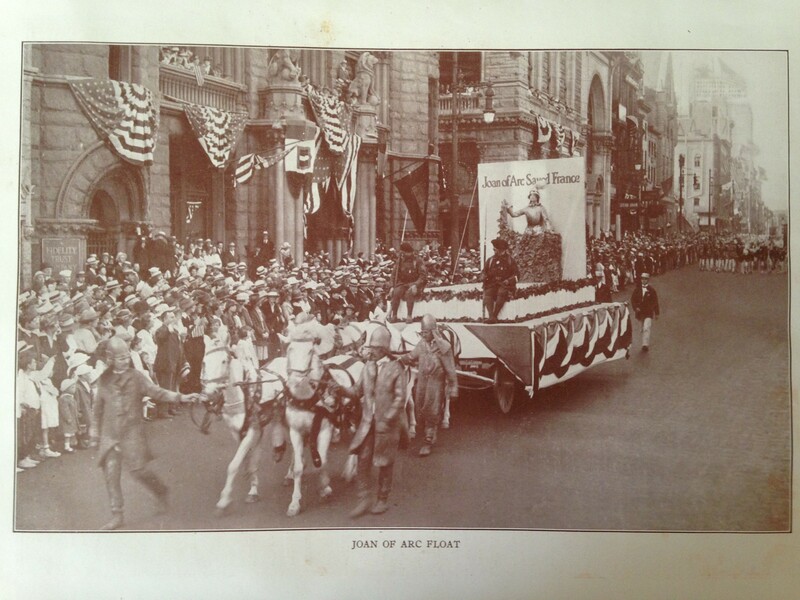 The third float featured Joan of Arc, holding upward the drawn sword of France. 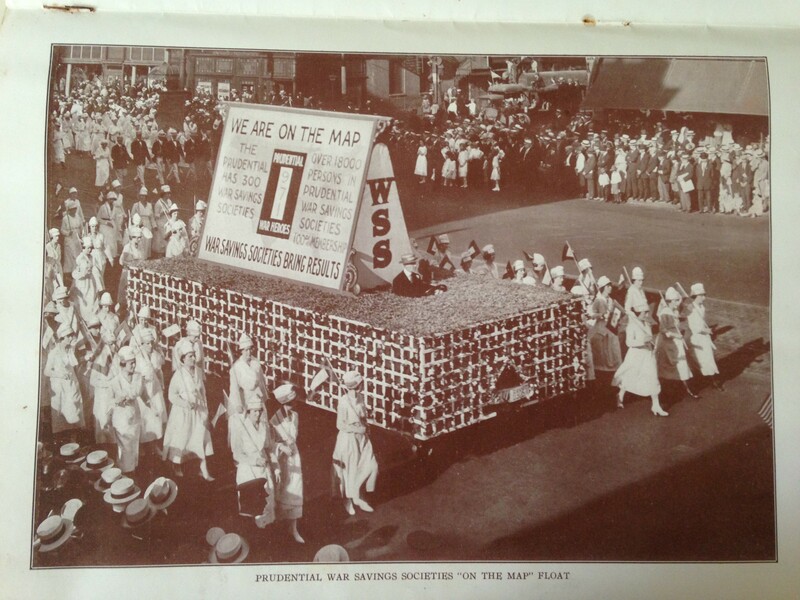 Miss Grayce Blagge who posed for the poster used by Washington to promote the sale of War Saving Stamps reprised her role on this float. On each corner of the float in front of her sat one of the French “Blue Devils”. The float was drawn by four white horses. ” The Prudential has 300 War Savings Societies. ” Over 18,000 persons in Prudential War Savings Societies, 100% membership. The marchers also carried placards with various anti-German slogans, among them : ” Get Kaiser Bill’s Goat, Buy W.S.S.” (War Saving Stamps). The slogans ,no doubt, roused the crowd to a patriotic fervor . The Red Cross, Liberty Loan, Y.M.C.A. and War Gardens, had separate and distinct parts in the line. All carried insignia representing their particular work. 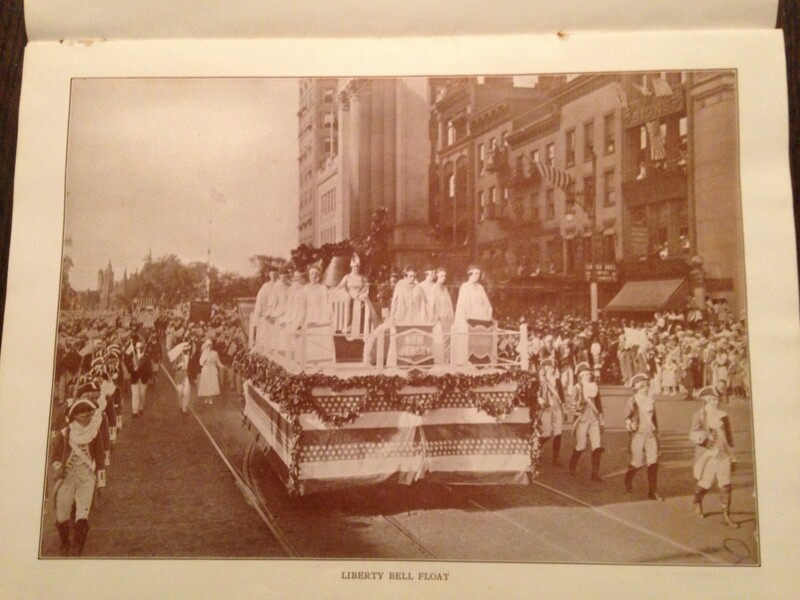 Through the efforts of Prudential officials Newark was enabled to secure Frank A. Vanderlip, head of the War Savings movement in the nation, Governor Walter E. Edge, of New Jersey, Brigadier General William A. Mann, in command of the Eastern Department, United States Senator Joseph S. Freylinghuysen and several others to review the procession. After the parade an open air music festival was held in Weequahic Park. There was a chorus of several thousand voices and the band from the naval training station played. As a sequel to this event it was announced that more than a million dollars in War Stamps had been sold in Newark. 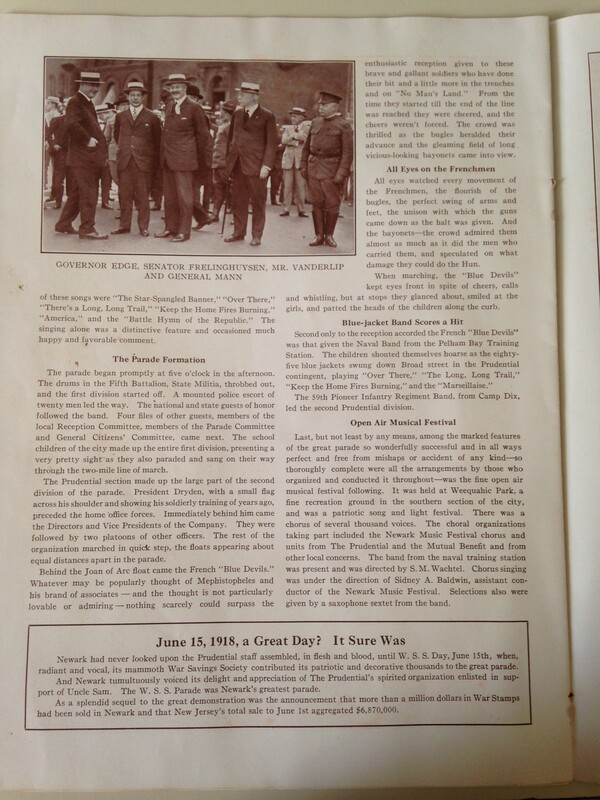 June 15, 1918 was a very proud day for Prudential and the city of Newark. 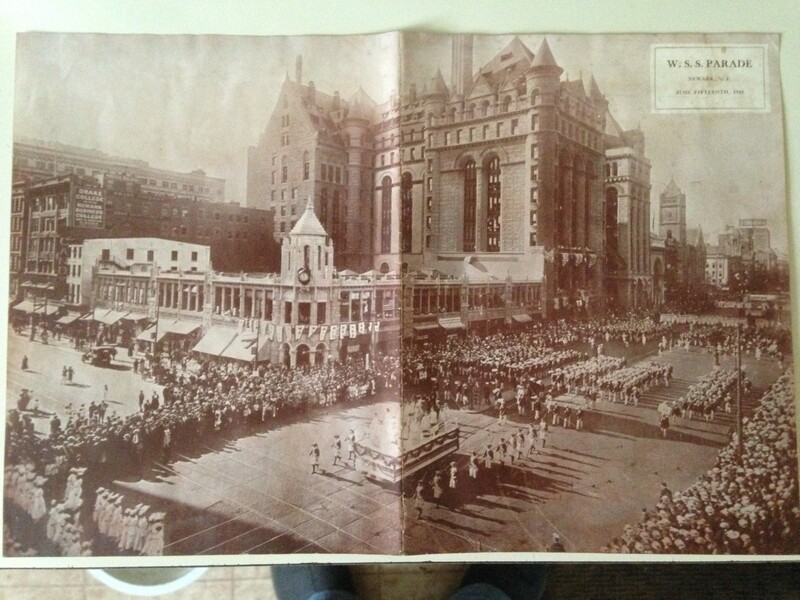 Very interesting material about WWI parade. Can you tell me the name of publication this is reproduced from?